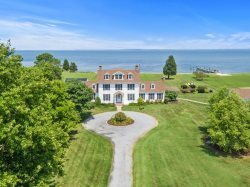 Elegantly furnished and located in a prestigious estate area of Talbot County, Blue Gates offers a chance to experience the best in Eastern Shore Living. Some of the wonderful amenities include a waterfront, private pool, four acres of property, and a dock on the Tred Avon River with a rare-to-find boathouse. Inside you'll find calm and soothing colors, ample sleeping accommodations with two kings, a kids' bedroom with three twins, a downstairs room with a daybed and private bath, and a private den with a sleeper sofa. All bedrooms have their own bath. Located just outside Easton, with easy access to St. Michaels and Oxford, this is a terrific property for exploring all of Talbot County. Swimming Pool: Please note our swimming pools are open from May 15-October 15. Please be sure to bring your own pool towels. Dock Information: 60 ft with 5ft MLW, water, electricity, and boat house. Please note boat lift is not available for guest use. To ensure proper sizing for your group, please bring your own life jackets, or we can recommend a rental agency. Fireplace: Wood-burning. Firewood is not provided. WiFi: Please note that the rural nature of the area limits the data access and some properties can experience slow speeds, or access limited to email and web browsing and not streaming. Grill: This property has a charcoal grill. Charcoal and lighter fluid is the responsibility of the guest. Note: Caretaker lives in the guest house. All ESVR properties include bed and bath linens, beds made prior to your arrival, and a starter supply of toilet paper, bathroom soap, paper towels, and dishwashing detergent. Please be sure to add these items to your grocery list for the duration of your stay. Please Note: Weddings and special events of any kind are not permitted at our vacation rental properties due to local zoning ordinances and our homeowner agreements. Blue Gates is lovely. The new addition to the house, new pool and landscaping, as well as the small changes in the house, like shades in the master bedroom--thank you, were all outstanding.